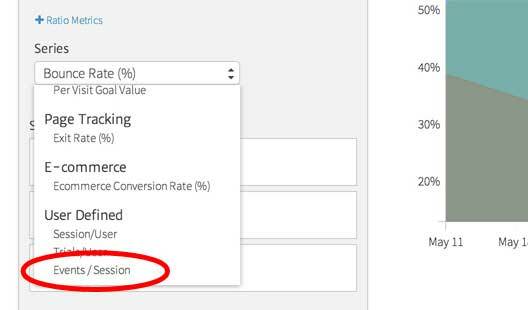 Ratio Metrics enable you to create a new, custom metric, from existing metrics in Google Analytics. For example, if you are tracking video play events, and you want to create a chart showing the ratio of plays to sessions, you can us a Ratio Metric. Ratio Metrics are available on the General Purpose and Historical Comparison widgets. To create and use a Ratio Metrics, open the widget editor and click on “+ Ratio Metrics”. This will open the Custom Ratio Metrics modal window. 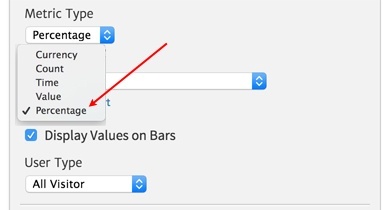 Click on “+ Create a New Metric” to define your ratio metric. Here, you can give your metric a name, and define the numerator (top of the ratio) and the denominator (bottom of the ratio). In the example shown below, we have defined Events / Sessions which we are going to use to track the video plays per session. 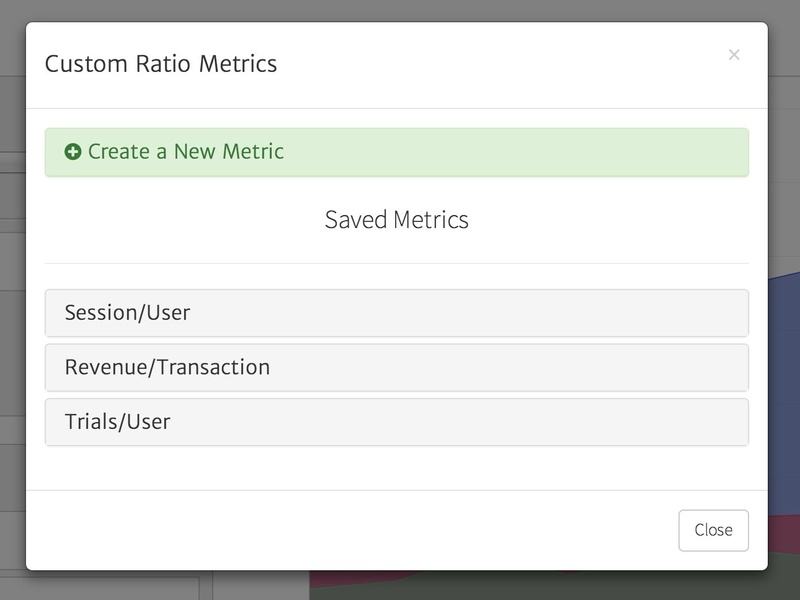 Once you have created a Ratio Metric, you can use it in the widget (or any other widget that supports Ratio Metrics). Open the Series selector and scroll to the bottom. Your new metric appears in the “User Defined” section. Don’t forget to click on “Apply Selection” to apply the selected metric to the widget. Note that in some widgets (e.g., Metric Timeline) your ratio metrics will only show up when you have selected the correct “Metric Type”. For example, the “Events / Sessions” ratio metric we just created provides a percentage. So, this metric will only be available in the Metric Timeline (and some other widgets) when the “Metric Type” selected is “Percentage”. The image below shows where you select the “Metric Type” in the Metric Timeline widget. The widgets that can chart multiple metrics with a single axis require you to pick a “Metric Type” in order to prevent the comparison of apples to oranges (like a percentage to a currency). Other widgets, like the Rolling Average, that can only display a single metric, do not require you to select a “Metric Type”. In these widgets, your ratio metrics will always show up in the “User Defined” section. As-is, the “Events / Sessions” ratio metric we just created will use ALL the events in the ratio. Since, we only want to track the video play events, we need to select those using the event editor. 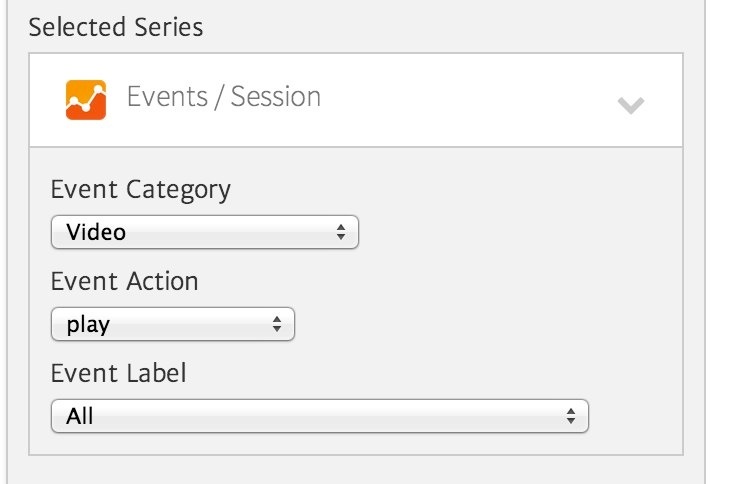 To do that, click on the down arrow on the “Events / Session” series to open the editor. Here, we can select the Google Analytics Category, Action, and Label that define the video play event that is being tracked on the website. 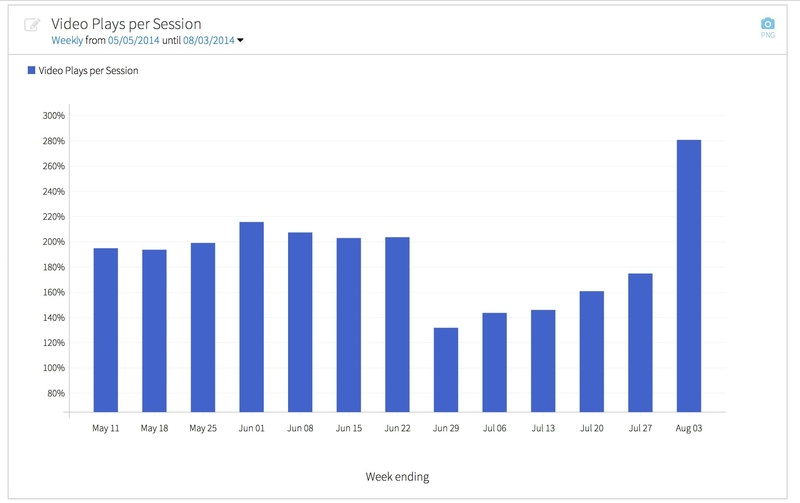 Lastly, you may want to edit the title of the series, so that it display “Video Plays per Session” in the chart, instead of the default Ratio Metric name. The final result is a chart showing the average video plays per session over the selected period.